A would-be thief was pulled to the ground by staff after he attempted to steal a bracelet from a Bognor jewellers on Sunday afternoon. Police said a man entered H Samuels Jewellers, in London Road, Bognor, and snatched a gold bracelet that he had asked to look at. The man ran off but a member of staff chased and caught him and retrieved the bracelet before the man ran off empty-handed, police have confirmed. Emre Sen, who works opposite at the Clockhouse Café, said he ran out to help hold the man down after he heard a shop assistant shout for help. Police said the man threatened to injure the staff member and she backed away while he ran off empty-handed, accompanied by a woman who had waited outside the shop for him. 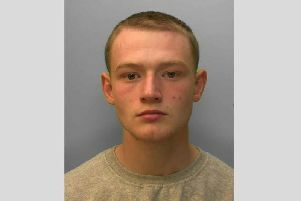 Anyone with information can contact Sussex Police at www.sussex.police.uk/appealresponse or call 101, quoting serial 879 of 12/08.